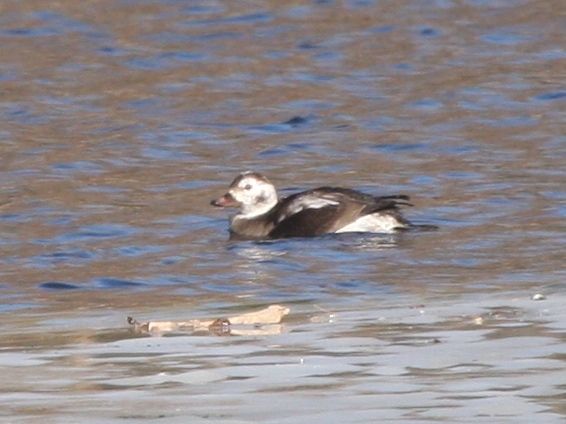 Yesterday we "chased" an Oldsquaw, or to be more scientifically and politically correct, a Long-tailed Duck, Clangula hyemalis. 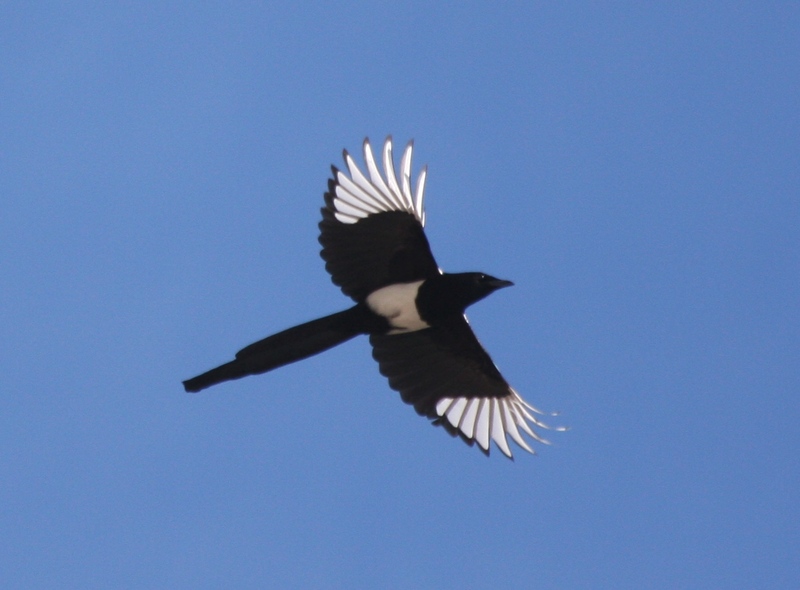 Though not particularly rare in Colorado, this species has eluded us ever since we started birding. 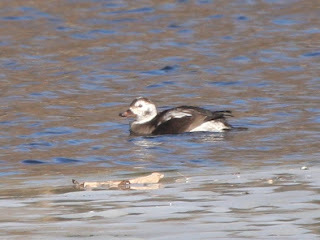 I (Marcel) finally saw my lifer Long-tailed Duck in Maine this summer, but Joel had yet to see one. 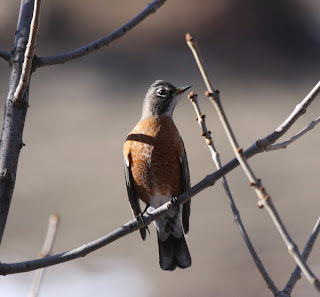 Seizing the opportunity of visiting the Denver Art Museum, we took the short side trip to the Denver City Park to look for a long-staying immature male bird. 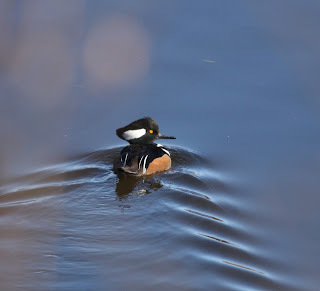 True to form, we easily found it in the Duck Pond behind the Denver Zoo, among the more common Mallards, Northern Shovelers, Redheads, Ring-necked Ducks, Common Goldeneyes, American Coots, and Canada Geese. 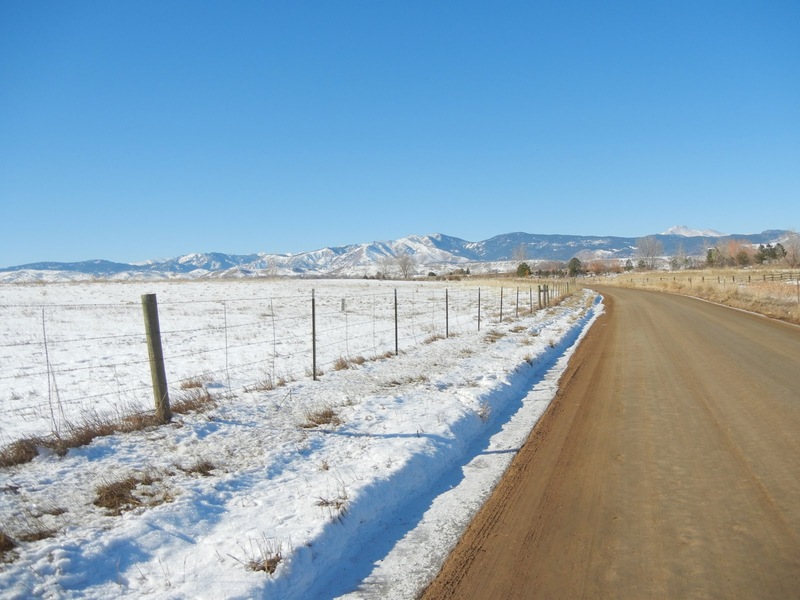 It's 8 PM on December the 20th, and we're pulling up to the Sochi-Floyd house in Lafayette, Colorado. 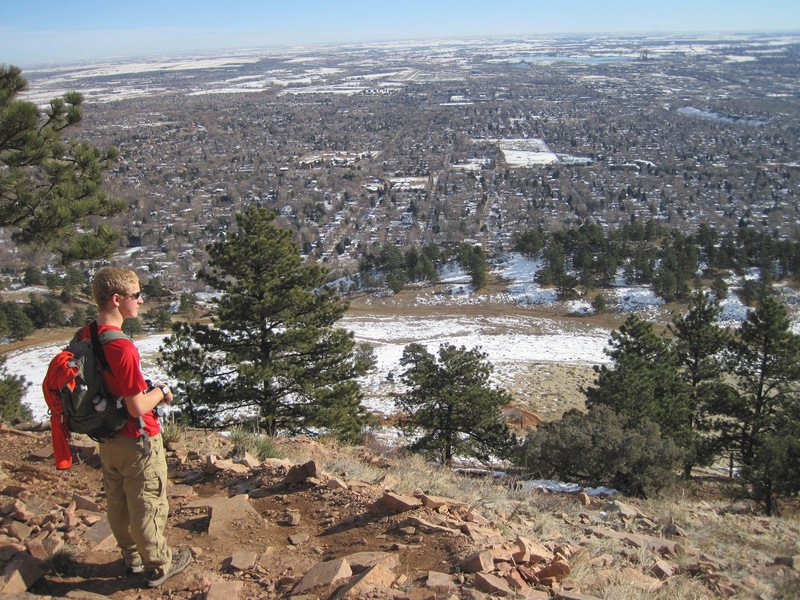 Unrolling sleeping bags on their living room floor, we make last minute plans with Birding magazine editor Ted Floyd for our 4:30 AM departure for Colorado Springs and the Fountain Creek CBC. For the past two years of doing this count with Ted, we have left around 3 AM in order to arrive in time to try for Western Screech-Owl. With the 100% precedent of only seeing Great Horned Owls on these pitch dark outings, Ted decided to grant us all a couple of hours more sleep. 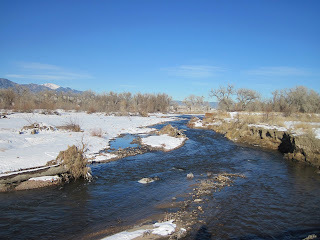 At 6:30 AM, we stepped out of the car in the parking lot of the Fountain Creek Regional Park's nature center, the sun still a good half-hour from breaking the horizon. Accompanying a deep hoot, a large, broad-winged bird swooped up the river corridor to land in a nearby cottonwood. 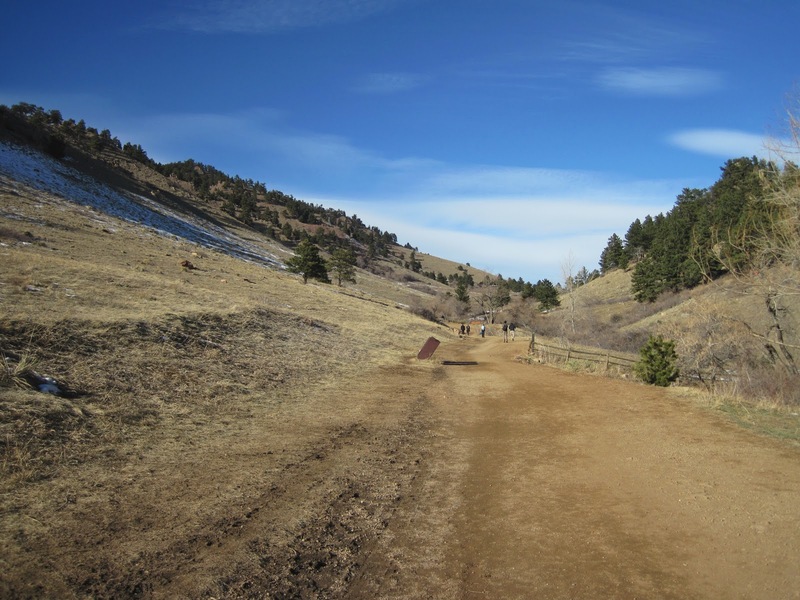 "Leaving two hours late didn't cost us Great Horned Owl," I thought ruefully. 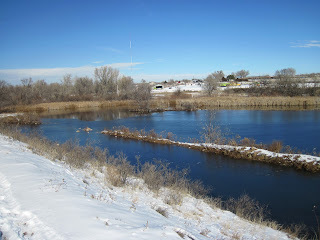 As the four of us (we picked up Allan Burns of the Springs en route) descended into the riparian corridor of Fountain Creek, the high-pitched, bell-like flight calls of American Tree Sparrows emanated from the surrounding brush along with the notes of Dark-eyed Juncos and White-crowned Sparrows. 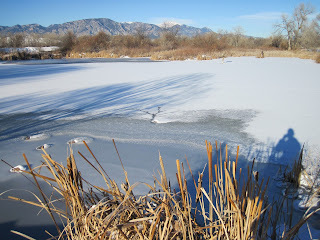 The first of many, the husky chuck of a Song Sparrow came from the cattails lining one of the many ponds in the area. 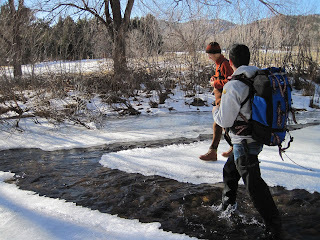 Throughout the course of the morning, we repeatedly traversed the two miles of river corridor assigned to us. 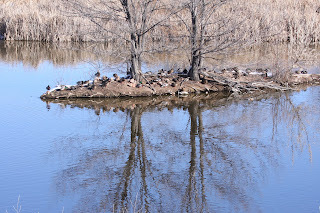 We puzzled over the many "White-cheeked" Geese in the area, weighing our opinions on the differences between the nearly identical "Lesser" Canada Goose and the Cackling Goose against each other. 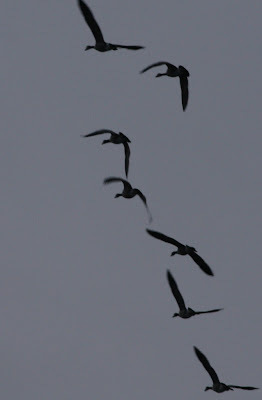 The two Ross's Geese we found mixed in with the flocks of "Canadian Honkers" was a first for the count. The Virginia Rail, Marsh Wren, and Swamp Sparrows we found in the cattails are species that are localized to this area during the winter. As the time for the midday compilation neared and we were forced to return to the nature center, I quickly counted up our list for the day. 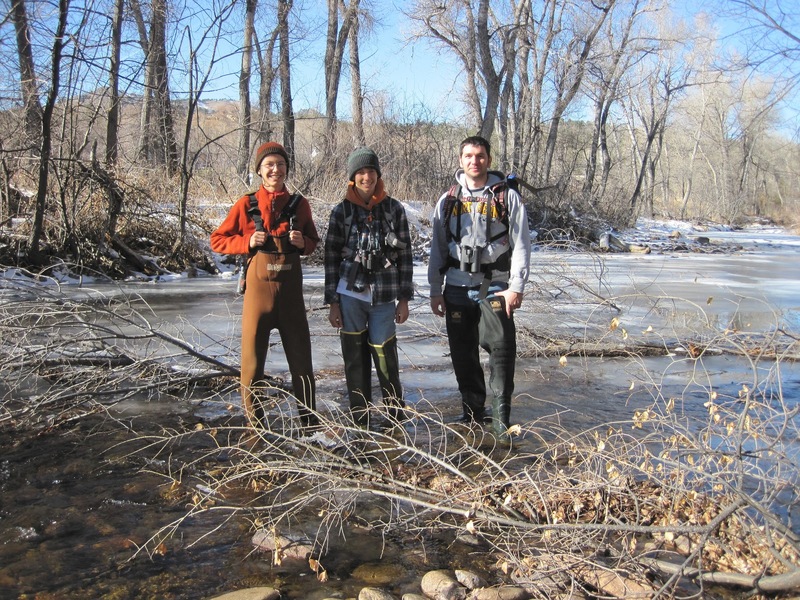 I listed 48 species. "We can't go back until we have fifty!" said Ted, half jokingly. Unfortunately, there was really only one more potentially easy species, House Sparrows at the nature center feeders. Sure enough, we found two of them feeding on the ground at the nature center. Resigning ourselves to 49 species (we were already 15 minutes late), we pulled out our lunches and entered the nature center where the compilation was being held. Halfway through the reading of the list by compiler Dan Maynard, Allan started pointing out the window and saying "Ted! Ted, look! Look up there!" 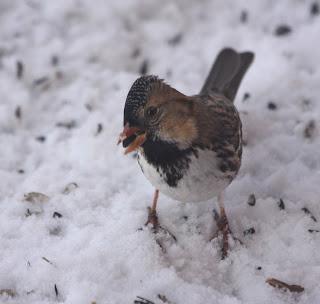 Sure enough, a male Harris's Sparrow was feeding under the feeders right outside the window. 50. 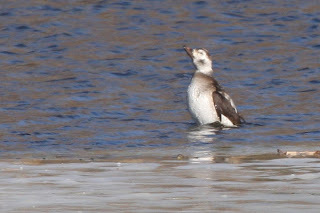 And then, at the end of the compilation, somebody else started pointing out the window and saying, "That's a weird looking White-crowned Sparrow." With many people now gawking through the window, it turned out that it was actually a White-throated Sparrow, yet a new species for the day, and our final. On Sunday, December 18th, we hit the trails of Mount Sanitas for the Boulder Christmas Bird Count. Though a rather small area for the Boulder circle, this area can take all day because of the miles of trail needing to be covered, and only a tiny section of road in one corner, which de-marks one of the easier habitats to cover, the foothill's suburbs. 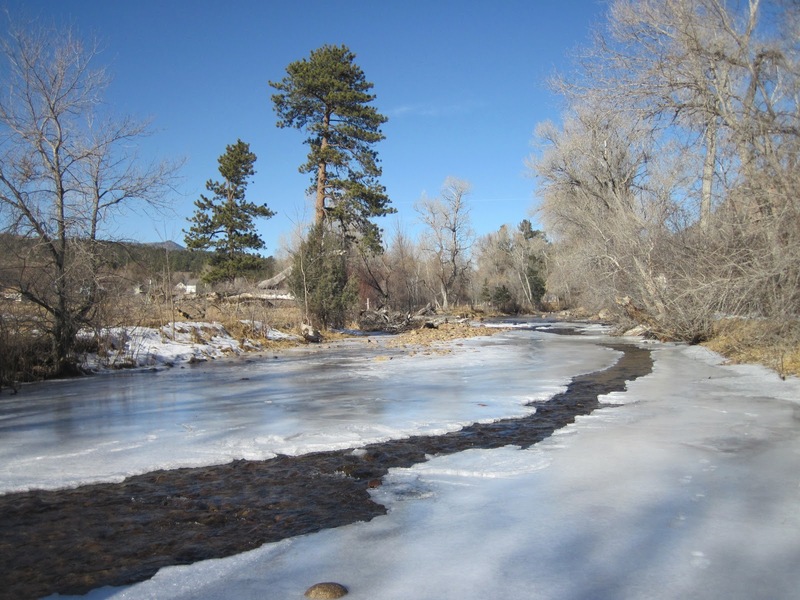 Elsewhere, it is foothills Ponderosa Pine forest, with some scattered Wild Plum riparian areas. These habitats don't have as high a density of birds - typically just a handful of roving wintering flocks of juncos, chickadees, and nuthatches, plus some scattered jays and woodpeckers - but that makes it all the more difficult to obtain accurate counts. 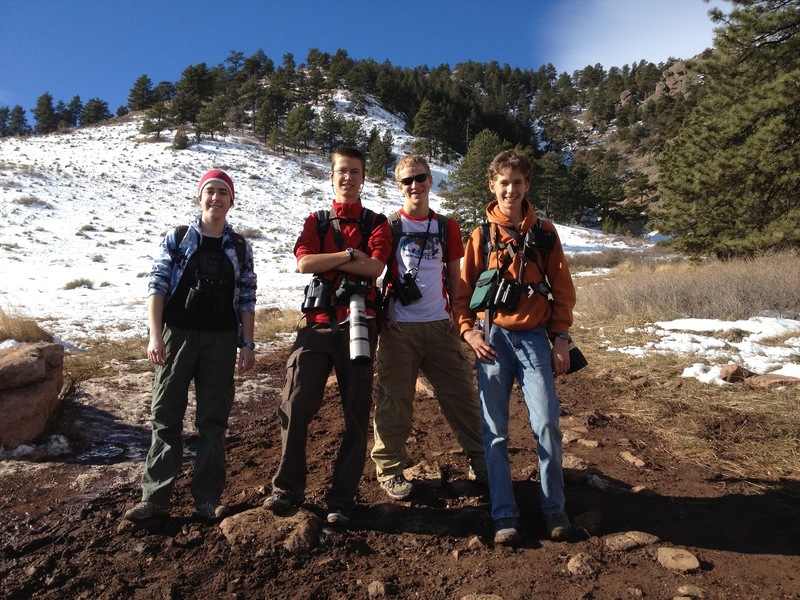 For the previous two years we have covered this area by ourselves, but this year we joined forces with the newly formed Boulder County Audubon Teen Naturalists' program for a great day of hiking and birding. Northern Goshawk - 1 flying through Sanitas Valley. 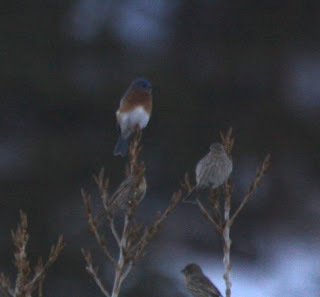 Eastern Bluebird - 1 male, we typically see Western Bluebirds in this area, which is what we originally identified this bird as. 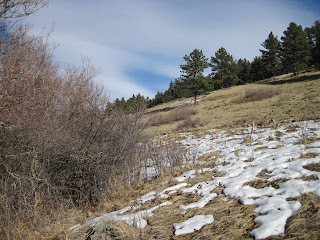 Looking at photographs that Joel took, however, caused us to doubt this assumption. 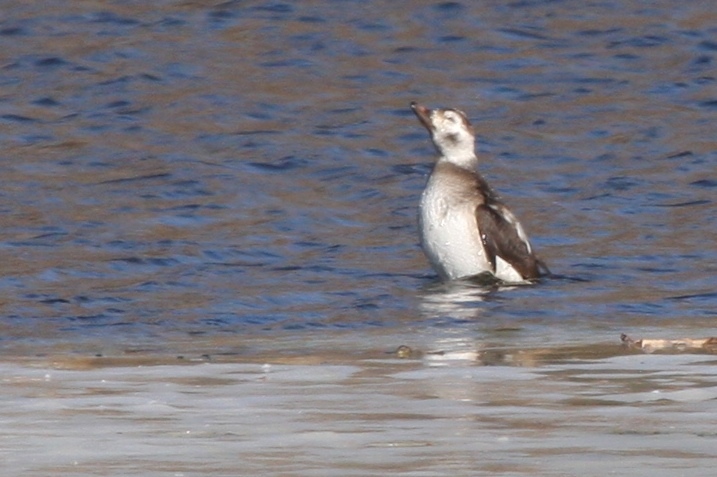 The correct identification was actually Eastern. 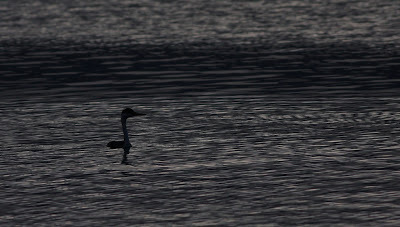 We did not obtain any pictures of the female, so we cannot be certain of its identification. 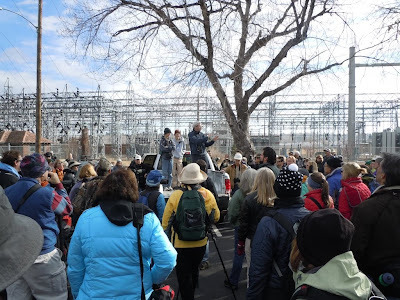 To kick off the Christmas Bird Count (CBC) season, we participated in the Longmont count circle with Bryan Guarente on Dec. 17th. 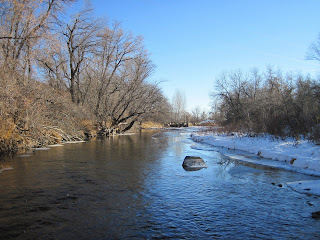 Our plan for the day was to hike a bit of Hall Ranch and spend the rest of the day trekking through the partially frozen Saint Vrain River in waders. 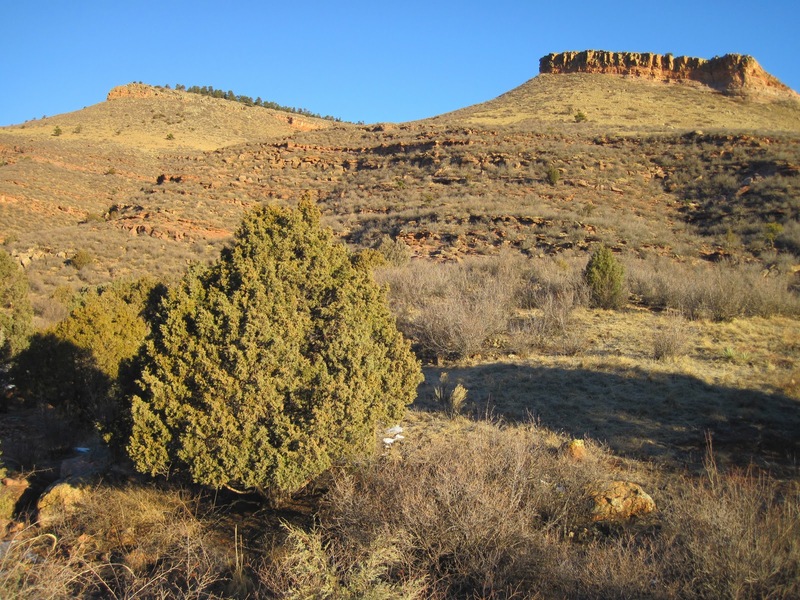 At Hall Ranch, we hiked one and a half miles through the juniper scrubland picking up many Western Scrub-Jays (12) and Townsend's Solitaires (22), plus a Spotted Towhee meowing in the shrubs and a male Cassin's Finch amongst the numerous House Finches. 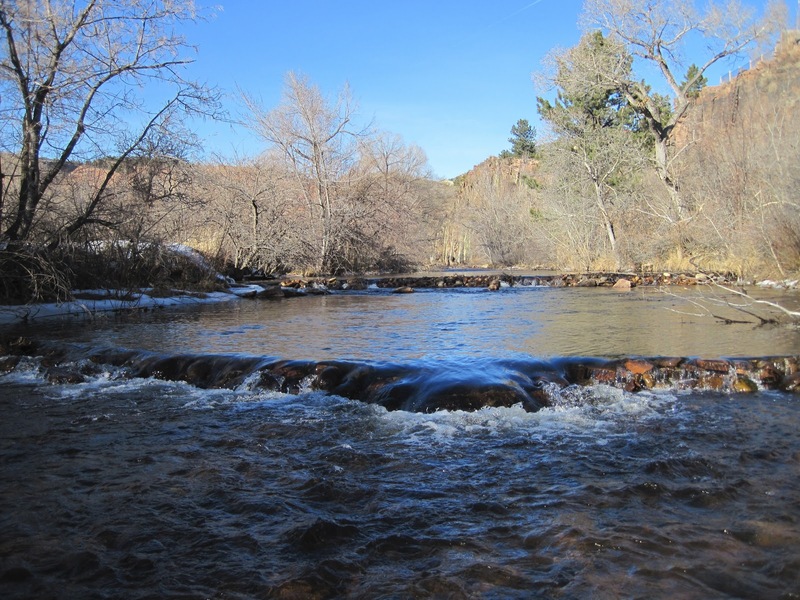 We covered four miles of river from the intersection of Highways 36 and 66 (just east of Lyons, CO) to half way up Apple Valley Road (northwest of town). One of 18 American Dippers seen up the river. This video will give you a good idea of what it was like to walk through some parts of the river. 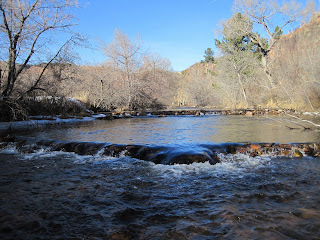 After our excursion on the river, we drove around the remaining area including the Lyons Cemetery (1 Merlin), and up Red Gulch Road (19 Wild Turkeys). 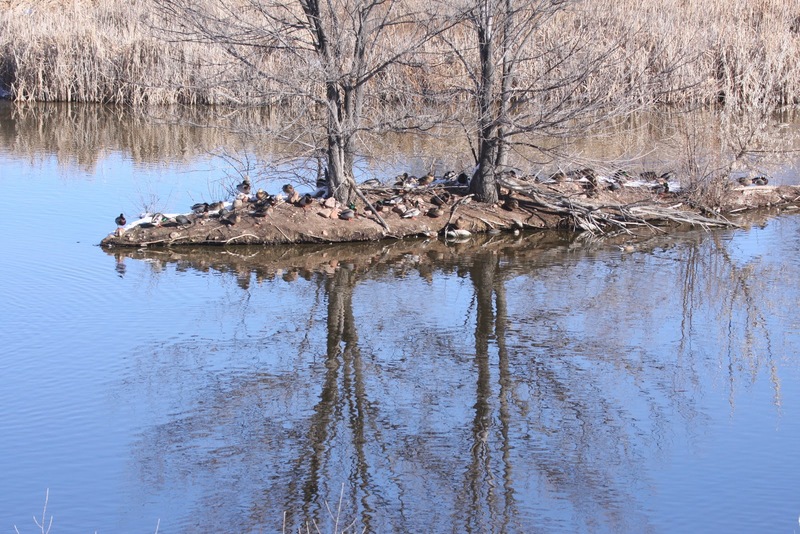 Mallard – 10 in the river. 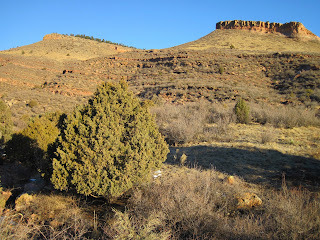 Wild Turkey – 19 in the tops of trees at the bottom of Red Gulch Road. 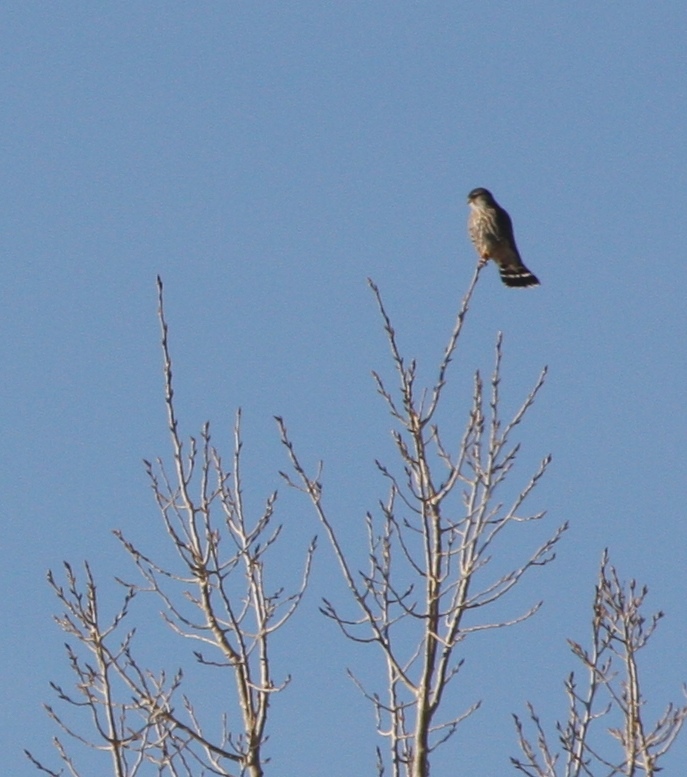 Sharp-shinned Hawk – 1 fly-by. 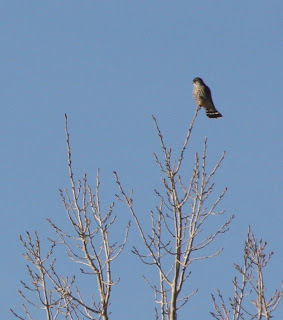 Cooper’s Hawk – 1 along the river. Bald Eagle – 1 immature on the foothills highway, and 1 adult flying low over the river. 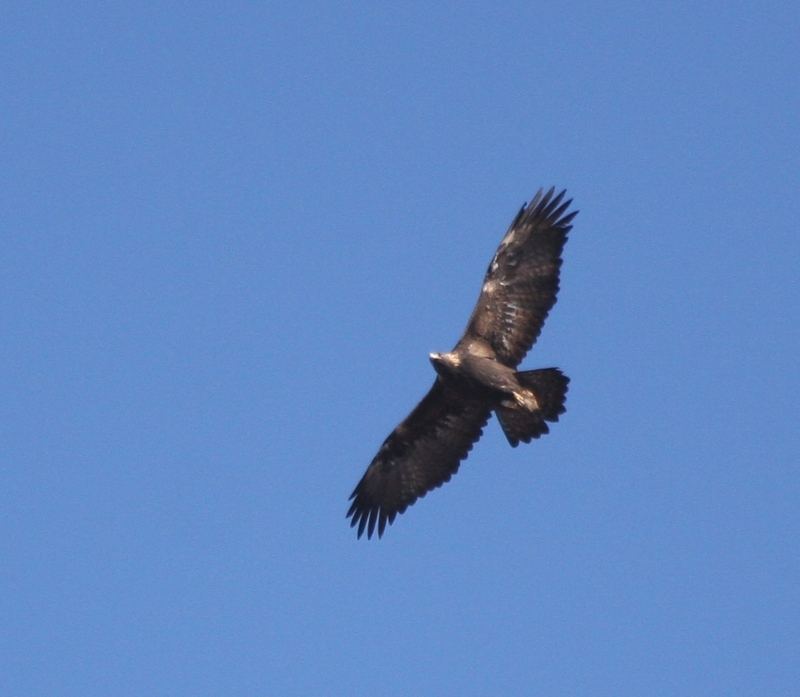 Golden Eagle – 1 perched on the sandstone cliffs of Steamboat Mountain. 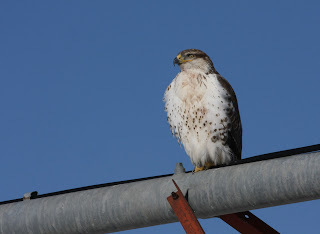 Red-tailed Hawk – 9 seen here and there. Harlan’s Hawk – 1 perched on a power pole along the Foothills Highway. 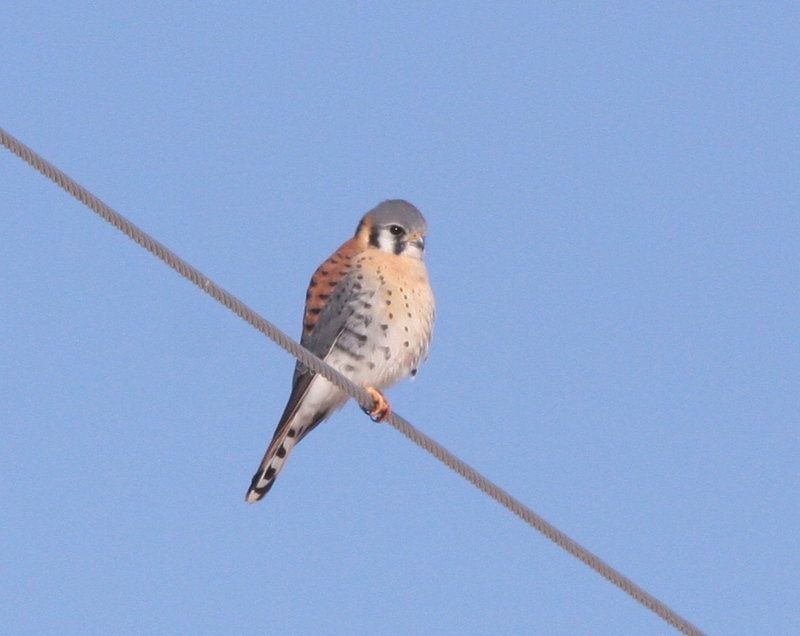 American Kestrel – 11 mostly along the Foothills Highway. 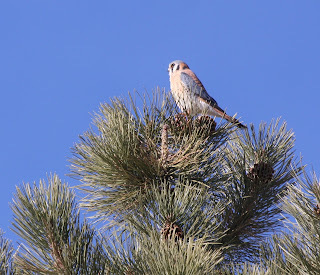 Merlin – 1 perched in the top of a backyard tree near the Lyons Cemetery. 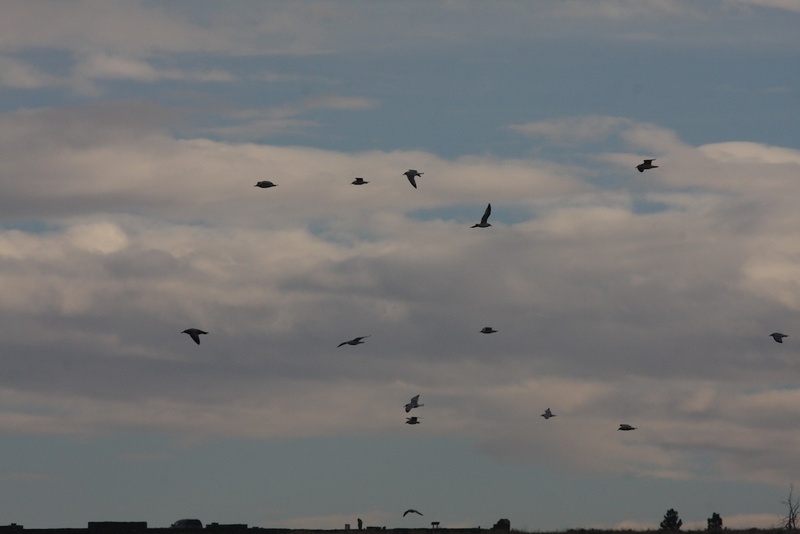 Rock Pigeon – 47 along the Foothills Highway. Eurasian Collared-Dove – 27 around the Lyons Cemetery. Belted Kingfisher – 8 along the river. Steller’s Jay – 2 on Twilight Road and Hall Ranch. Blue Jay – 5 along the river. Western Scrub-Jay – 13 at Hall Ranch. American Crow – 5 or so heard only. 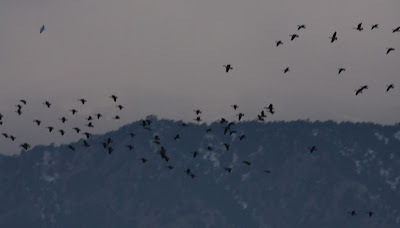 Common Raven – 13 along the river. Black-capped Chickadee – 24 mostly along the river. White-breasted Nuthatch – 3 at Hall Ranch. Brown Creeper – 4 along Apple Valley Road. Canyon Wren – 1 on the sandstone cliffs of Meadow Park. Winter Wren – 1 at the very south end of Apple Valley Road along the river. 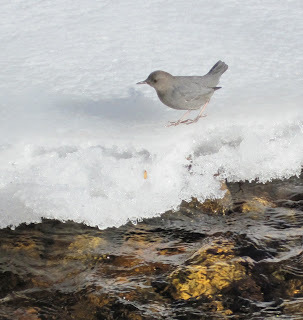 American Dipper – 18 along the river (last year’s dipper count was over 40). Ruby-crowned Kinglet – 1 along Apple Valley Road. 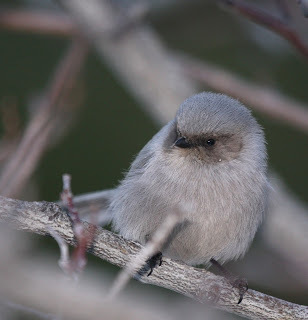 Townsend’s Solitaire – 44 mostly at Hall Ranch with a few along the river. European Starling – 54 in the town of Lyons. Spotted Towhee – 1 at Hall Ranch. American Tree Sparrow – 6 mixed in with flocks of juncos. Song Sparrow – 5 along the river. White-crowned Sparrow – 3 in with the mixed sparrow flocks along the river. Red-winged Blackbird – 4 along the Foothills Highway. Cassin’s Finch – 1 at Hall Ranch. American Goldfinch – 1 along the river. House Sparrow – 18 in Lyons. 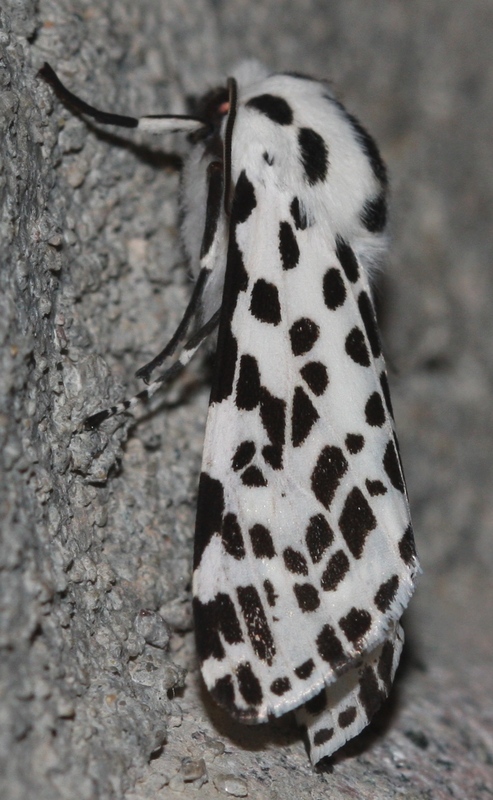 Check out the Yard Moth Challenge! Check out the Yard Moth Challenge blog (yardmoths.blogspot.com), where I (Marcel) have recently started contributing. This morning was the Boulder County Audubon Teen Naturalists' inaugural event, a wintering raptor survey in Boulder County. With three participants - myself, Joel, and Skye Lewis - and our able guides Steve Jones and Sarah Bexell, it was a great beginning of what looks to be an excellent group. We surveyed Boulder County Nature Associations' South Rabbit Mountain route north of Boulder, and had a good number of hawks, kestrels, and eagles, marking the locations of the birds on a topographical map for a county-wide database of such sightings. 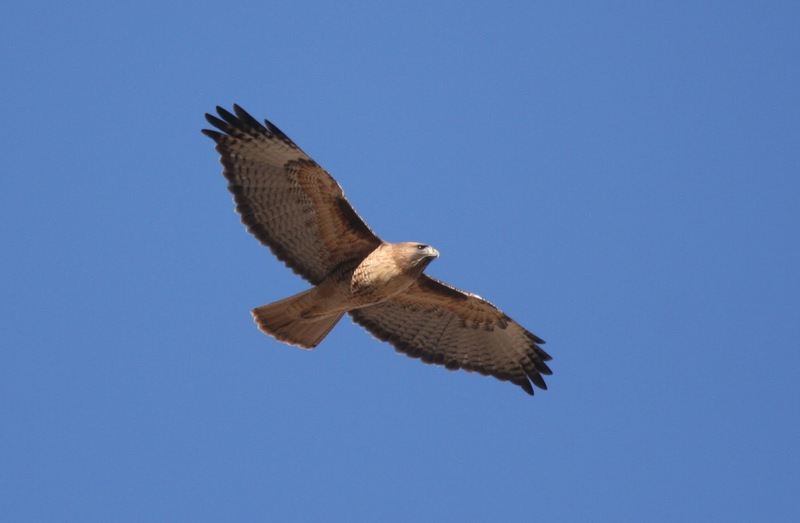 And though raptors were our main focus, we also enjoyed the other wintering bird species that we happened across. 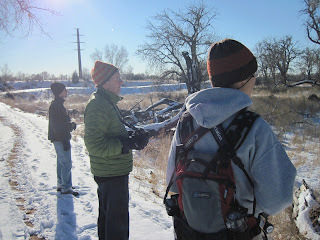 As we gathered back at our meeting point, Joel spotted an adult Bald Eagle flying over, a fit end to a wonderful morning. Too bad it wasn't countable for the survey! 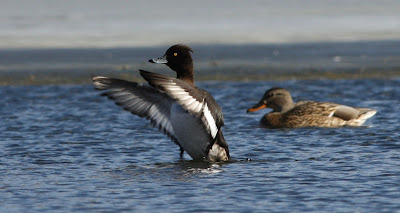 Tufted Duck at Golden Ponds, Longmont, Boulder County, Colorado. Third state record. FYI, the Sweaty Sanderlings is a communal blog with some other youngish birders and records our birding while running exploits. 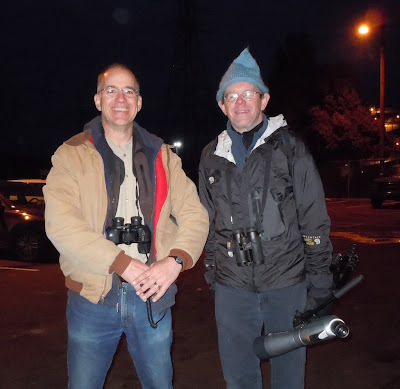 We happened to be running at Golden Ponds on January 18th when Larry Semo and Steve Mlodinow found the bird. So you're not confused, for this blog we all use nick names . . . Marcel is Masai and Joel is Welch. 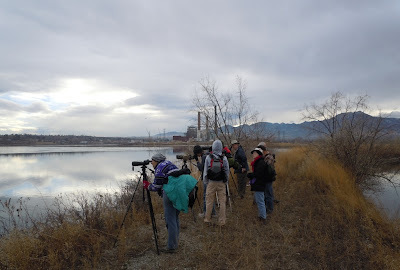 Yesterday, January 8th, was the annual Xcel Energy/American Birding Association/Colorado Field Ornithologists/Denver Field Ornithologists/Boulder Bird Club/Nikon Sports Optics Valmont Power Plant “Gullapalooza” field trip. 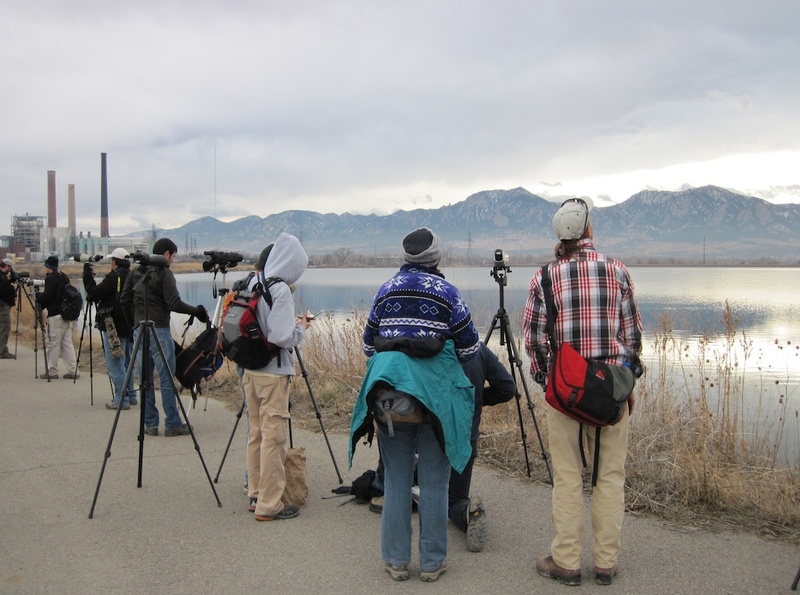 A major seasonal highpoint for the Front Range birding community, this trip – one of the largest regularly organized events in the country – draws massive numbers of birders from up and down the Front Range, from Fort Collins to Colorado Springs. For the 2010 venue, an incredible total of 121 participants signed up, a total which few thought would be broken. But, this year an unbelievable 227 signed in, with many more slipping through without being counted. What makes this trip so popular? Many factors come into play here, some of which are listed below. 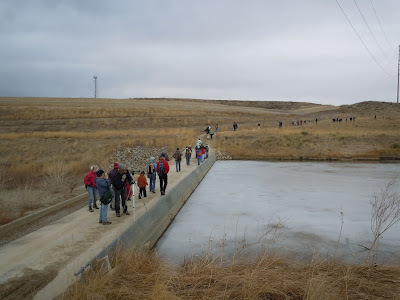 The Valmont Power Plant in Boulder and its adjacent cooling reservoirs are generally closed to the public, only opening once or twice a year for these heavily attended field trips. At all other times, the closest viewing is a half a mile away at nearby Legion Park or Red Hill, where, with the help of super powered optics, one can just make out the vast numbers of distant ducks and roosting gulls on the two closest reservoirs, Hillcrest and Valmont. The third reservoir, Leggitt, however, is too far away for any possible viewing. So, when a chance arises to get “up close and personal,” people understandably jump at the opportunity. 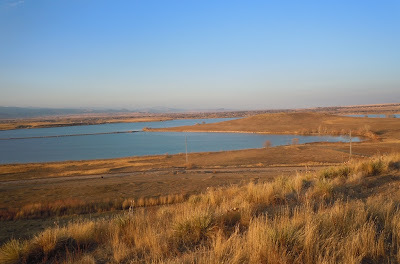 Merely by themselves, the Valmont reservoirs are nothing special . 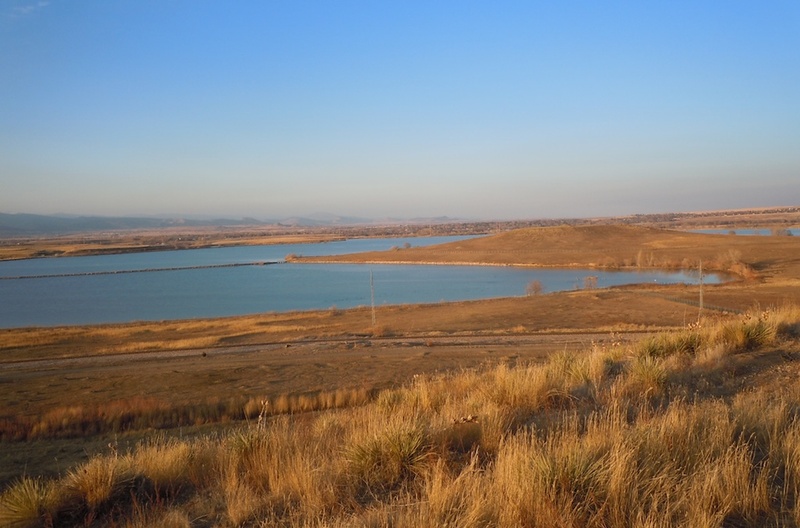 . . just some other large, deep reservoirs, but with an industrial landscape on half its shoreline. 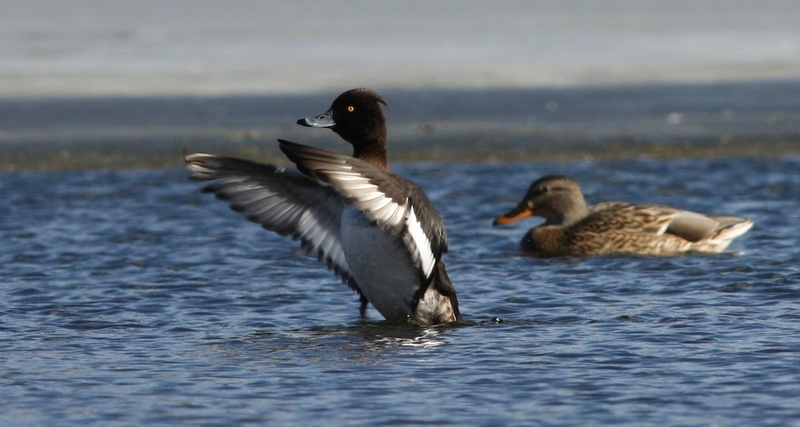 If any other lakes in the area are free of ice, you’re likely to have just as good of luck birding there. But add freezing cold weather, and Valmont instantly becomes a premier birding location in Boulder County. Because of warm cooling water being discharged from the coal-fired electrical production plant, the reservoirs remain open all winter, no matter how low the mercury drops. So, when all other potential lakes and reservoirs in the area freeze over, all of the ducks, geese, grebes, gulls, and other water-needy birds converge on the Valmont reservoirs, creating an incredible birding environment. With so many people converged on a single spot, this has become not just a birding trip, but also a massive social event. 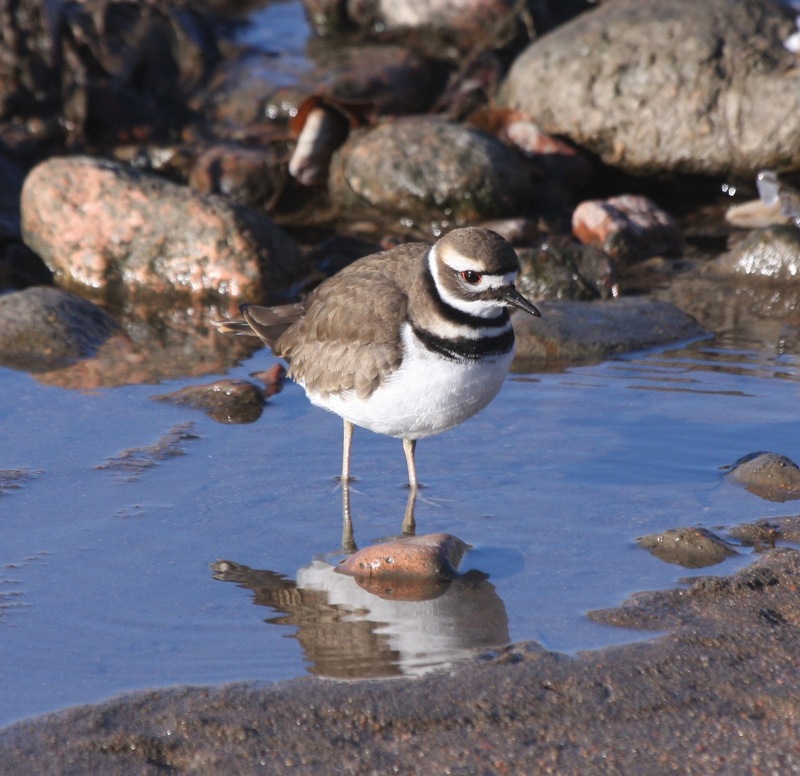 I can’t speak for everybody, but one of the main pulls to this event for me isn’t just the birds, but also the opportunity to meet, greet, and bird with some of the best birders in the state, or country, for that matter. 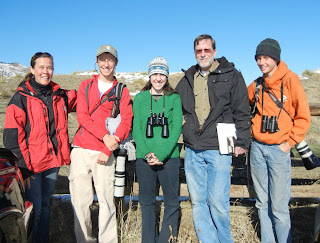 Among the excellent pool of trip leaders for this event are Ted Floyd, editor of Birding; Jeff Gordon, President of the American Birding Association; Bill Schmoker, one of the countries best known bird photographers; Nathan Pieplow, a bird sound expert and editor of Colorado Birds; Bill Kaempfer, an excellent Boulder County birder; and Mike Frieberg, an excellent birder and Nikon Birding Market Specialist. Joel and I were even invited to co-lead alongside Ted Floyd, which is a great honor and provides us with valuable experience. 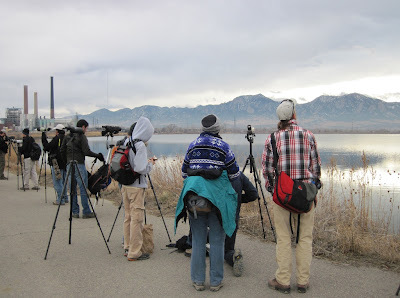 And, lots of other good birders show up and happily share their scopes and expertise with the crowd. Unlike nearly every other birding type field trip, the Valmont trip starts at noon! Because it is really cold in the morning, and because the regular waterfowl stay just as active in the afternoon as they are in the morning, and because the roosting gulls don’t come in until just before dark, it makes far more sense to start this bird walk at noon instead of the standard early morning departure. And, it seems, this time also appeals to a far greater number of people than just the die-hard bird freaks. So there you have it, if you ever want to create a super-massive field trip to rival all else, you know to largely restrict the site to birders except for one or two days a year; make sure that there are a lot of birds; make sure that you spread the word via the news media and internet; and start your trip at noon. 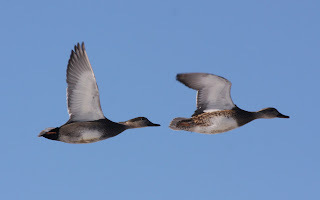 Though the conditions weren't completely perfect today - some of the nearby reservoirs had shucked their ice in the "heat wave" that started a couple of days before the walk - we still had good numbers of ducks, and a good variety of gulls (highlights being a Mew, a few Californias, and a couple of Thayer's and Lesser Black-backs). 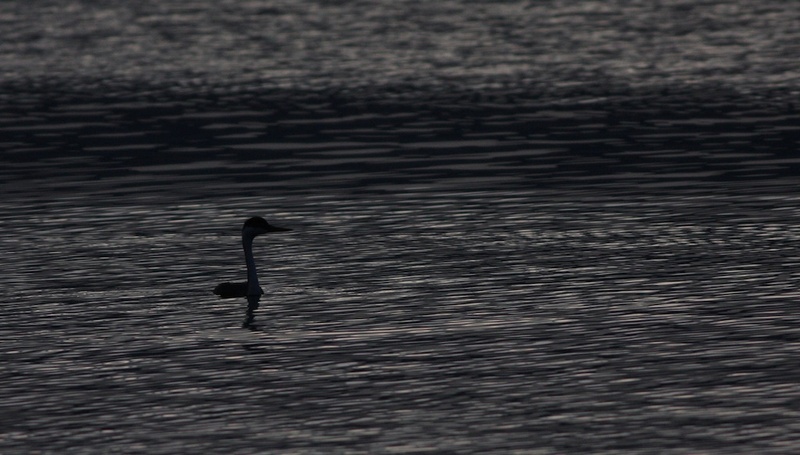 There was also a Tundra Swan that has made Valmont home for the past few weeks. both key players in the organization of this annual trip.